The upcoming federal budget may contain announcements related to the way healthcare is funded in Canada, including changes to the regulation of pharmaceutical prices. Value for taxpayer money should always be the focus for government, but the need for cost-containment needs to be balanced with access to optimal healthcare innovation for patients. Key to this process is the patient voice. 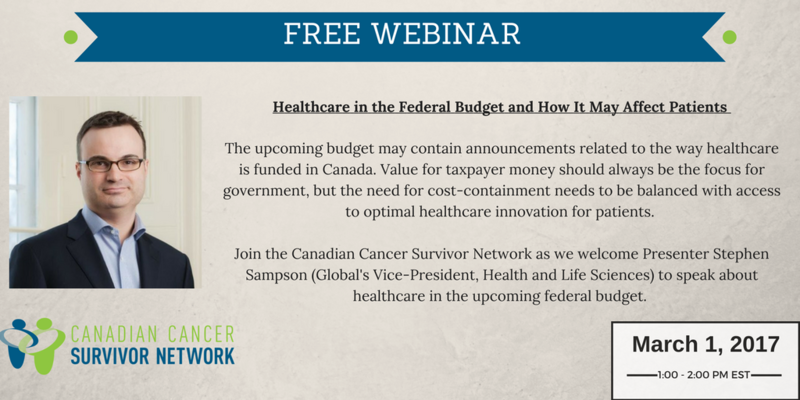 Join us for a webinar discussing potential health-related announcements in the federal budget, how they could impact your healthcare and what you can do to ensure the needs of patients are put first in this process. Can’t attend? Be sure to register in order to have a copy of the slides as well as a YouTube recording of the webinar sent to you. Stephen Sampson is Global’s Vice President, Health & Life Sciences and is based in Ottawa. With overall responsibility for the management of Global’s Health & Life Sciences practice, Steve helps lead an integrated team of policy professionals across Global’s network on business-critical health policy, regulatory and market access matters. Steve has specific experience in economic development and competitiveness policy, innovation in health care, market access and reimbursement, Health Technology Assessment (HTA), regulatory reform, intellectual property and international trade matters. Global’s Health & Life Sciences practice offers integrated public affairs support to clients in the innovative biopharmaceutical and medical device industries, non-profit trade associations, and other organizations engaged in public policy advocacy. Prior to his arrival at Global, Steve was a Director in the Government Affairs department at Canada’s Research-Based Pharmaceutical Companies (Rx&D), where his responsibilities included policy advocacy and development on a wide range of public policies impacting the innovative biopharmaceutical sector.